Learning a new language gives me a special buzz that’s hard to describe… somehow it feels like a different kind of learning to most other things. There’s a lot of memorising (alphabet and vocabulary), systematic understanding (grammar) and some skill in pronunciation and comprehension. To me it feels similar to learning a musical instrument in many ways. But you get to try it out on random strangers and communicate with people who otherwise might be out of your reach. 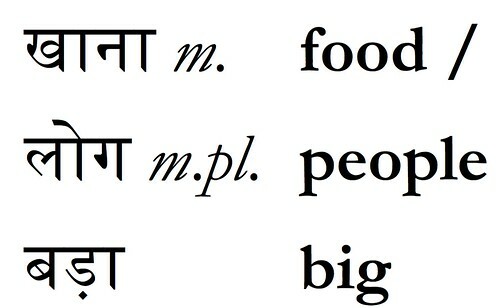 So as the title suggests (assuming your computer and browser are unicode compliant), I’ve recently started learning Hindi. This isn’t necessary at all in a place like Bangalore, where nearly everyone speaks English, and in fact the main non-English language here is Kannada anyway — a Dravidian (South Indian) language written using a totally different script and more closely related to Tamil, Malayalam and Telugu. But Hindi is widely spoken across India, and in its spoken form is almost exactly the same as Urdu which is spoken in Pakistan. Hindi-Urdu as it’s known is also in the top 5 for number of speakers in the world, so it has to be a good bet for a “useful” language to learn. I searched for a while for Hindi classes being run locally, but in the end I’m actually studying with a school in Delhi — 1000 miles away! — over Skype. This is working out very nicely, and after a busy day at work it’s good to simply head home and have my class there, rather than having to deal with Bangalore’s extended rush-hour twice in the same evening. I’m not sure if it’s related to the classes, and maybe having something new to focus on, but I’m feeling somewhat more settled now than when I wrote the “120 days” post. A couple of weeks back I was on my way to work and noticed that I felt much more relaxed and at home here. Part of it is feeling like I’m getting used to the way things are done in this part of the world. Having said that… I was scolded by a rickshaw driver the other day for giving him his fare with my left hand — I hadn’t come across that before! (Although I’m usually mindful of not eating with my left hand in public.) There’s always something to learn here. And for me, life is all about learning.